Below is a list of the places we stayed between Budapest, Hungary and Constanta, Romania, over the 2014 summer. They include GPS coordinates. We were/are budget travellers so cost was always kept in mind. However, we did not free camp or sleep in dormitories. We found some of the campsites indicated on our map or our (2008) Bikeline guide were closed, possibly due to severe flooding last year. The kilometres indicate the distance cycled from the previous night's accommodation including detours and wrong turns. 29/6/14 Budapest - Camping Arena. N 47 30.263' E 019 09.500' 4,500 Ft. Small, leafy with cheap meals at CEU university restaurant close by. 30/6/14 Rackeve - Thermal Campground N 47 10.762' E 018 56.762 5,600 Ft Expensive, good facilities. Approx 58 km from last. 1/7/14 Dunafoldvar - Kek Duna Camping N 46 48.726 E 018 55.609' 3,100 Ft. Simple campsite close to Danube. 2/7/14 Baja - Baja Camping N 46 10.724' E 018 56.764' 2,800 Ft. Busy, where Hungarians come to play. Approx 100 km from last. 3/7/14 Mohacs - Duna Panzio N 45 59.869' E 018 41.330' 7,000 Ft. Nice room, friendly, wine cellar in which to make meals. About 40 Kms from last. 4/7/14 Knezevi Vinogradi - Bike to Bed sobre N 45 44.694 E 018 43.647'. Croatian Kuna 200. Basic, small room made up for by warm welcome. Lots of communal space for cooking and bike storage. 60 km. 5 & 6/7/14 Osijek - private apartment N 45 33.344' E 018 40.680 (next door to Hotel Dravis at 23 Gunduliceva Street). Contact Robert on 098 373 895. Croatian Kuna 350 per night for two nights. New, comfortable apartment within walking distance of main sights and supermarket. 31km. 8/7/14 Vukovar - Martini Apartments $ Rooms, J.J. Strossmayera 19, email: apartments.martini@gmail.com Mob +385 (0) 98 95 10 349 N 45 21.204' E 019 00.058' Croatian Kuna 300/night. Friendly, comfortable apartments - upstairs. Secure bike parking. Approx 53 km from last. 9/7/14 Ilot - Sobe Ana, Petra Preradovica 54, T 032 596 259 M 099 190 5405. N 45 13.356' E 019 23.455. Croatian Kuna 75/person. Approx 40 km from Vukovar. Very welcoming & friendly, cheap, up 12 degree hill. 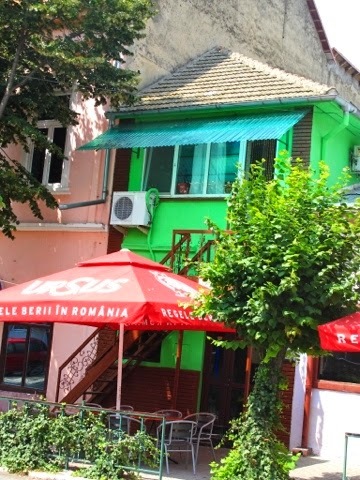 9/7/14 Novi Sad - Downtown Hostel, Njegoseva 2, N 45 15.330' E 019 50.695. Serbian Dinar 3,500. Centrally located, noisy if the Exit Festival is on in July. 49 Kms from last. 10/7/14 Surduk - Dunarsko Grezdo, rooms/camping. N 45 04.987' E 020 18.570'. Room €30 for 2 people. 51 km from last. 20/7/14 Kovin - Dunavski Plicak Guesthouse, Manastirska Rampa, 5.5 Kms after Kovin's Harbour. N 44 43.304 E 21 02.762' +381(0)638 353 085 €15 per person with breakfast. 60 km from Belgrade. We shared a great night with Alessandro and Dragana at their guesthouse near Kovin, about 60 km on from Belgrade. 21/714 - Beli Bagrem, campground west of Veliko Gradiste. N 44 45.619' E021 28.582'. 900 dinar. 51 km from last. Basic campground, near river in popular holiday spot. Plenty of restaurants nearby. 51 Kms from last. 22/7/14 - Camping by the Danube. N 44 38.860' E 021 50.190' tent site 400 Dinar, plus charges for shower. Cabin 1,340 Dinar including taxes. Pleasant spot with nice views of the river. Facilities simple but adequate. Small bar sells drinks. 45 km from last. 23/7/14 - Donji Milanovac. Room in family home. Excellent view of Danube from upstairs front bedroom. N 44 27.992' E 022 09.261. €10 per person. 42 Kms from last. 25 & 26/7/14 - Drobeta - Turnu Severin, Pensiunea Europa. B-dul Tudor Vladimirescu, nr. 66. 3 Star, small, pleasant hotel near town centre. N 44 37.916' E 022 39.246'. 27/7/14 - Califat - Room upstairs above small bar. N 43 59.732' E 022 56.009' Close to promenade with cafés and food. €15 per night per couple. 102 km from last. Rooms above a small bar in Calafat. 28/7/14 Zaval - campground with simple cabins, east of the town. N 43 50.428' E 023 50.867'. €10 for cabin that sleeps two. 86 km from last. 29/7/14 - Corabia - Hotel Sucidava on Edge of Danube. N 43 46.299' E 024 30.817'. 100 ROM for double room. Air con. 61 km from last. 30/7/14 - Zimnicea - Hotel Danubius, SC Donauland Teleorman SRL, in centre of town. N 43 39.295' E 025 21.982'. 130 ROM double room. Pleasant staff, old communist era hotel but ok. 92 km from last. 31/7/14 Giurgiu - Motel Cosmos. N 43 54.855' E 025 58.269' 90 ROM double room. 71km from last. 1&2/8/14 Oltenita - Pensiunea Azaro, Bd Tineretului nr 10, Mun. Oltenita N44 05.617 E026 38.350' 126 ROM double room. Try to get upstairs room with balcony. 78 km from last. 3/8/14 Ostrov - Pensiunea. N 44 06.593' E027 21.613' 100 ROM for double. Two pensiuneas are within 50 metres of each other as you cycle into town. 90 km from last. 4/8/14 Ion Corvin - Popa Vivi Pensiunea N44 06.380' E027 48.033' 100 ROM for double. 50 km from last. 5/8/14 Constanta - Hotel Capri, 109 Mircea cel Batran St. N 44 11.001 E028 38.888' €148.50 for double room. This sign outside a guesthouse in Ostrov, Romania, loosely translated means,"shelter from the wolves and liars." It was an absolute pleasure meeting you both, too. All the best in your venture. Other cyclists out there.... This couple deserve your support. You'll enjoy their company and have a great night's sleep. Go stay! Hi Mike and Judy, thanks for the blog. This is a trip we are also looking at doing. Were there any Warmshowers hosts along the way? We're gonna need a bike that de-couples though by the sound of it! Cheers, Fiona and Barry from Wellington NZ.